"New R.R. 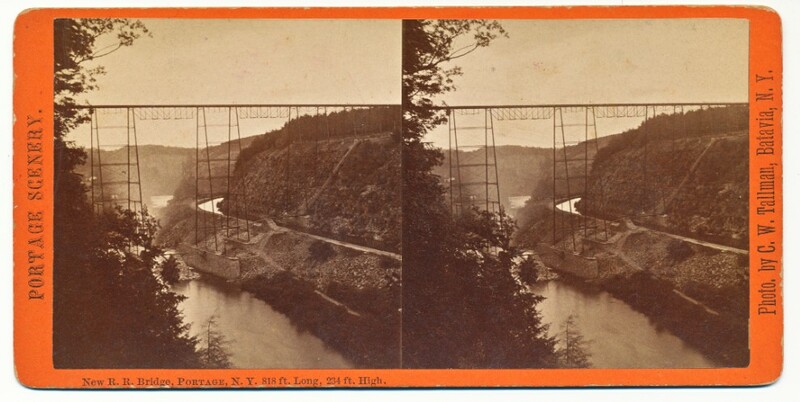 Bridge, Portage, N.Y. 818 ft. Long, 234 ft, High." This stereoview was made in the fall of 1875 or perhaps the summer of 1876. 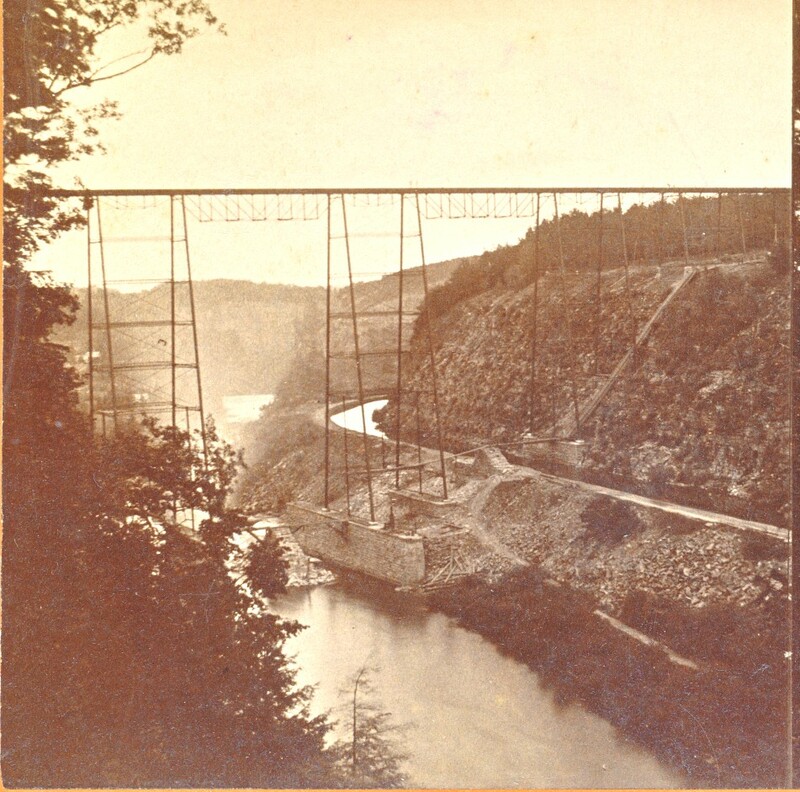 The Portage Wooden Bridge had burned in May 1875 and was quickly replaced by the "new" iron bridge seen in the image. If you examine the enlarged photo below, you can still see traces of the original bridge and construction debris. The Genesee River is the water visible at the bottom center of the photograph. A careful eye can pick out the mist from the Upper Falls just beyond the bridge. Above the river and to the right (east) is the Genesee Valley Canal. This part of the canal was the Section 58, officially known as the "Rock Section." Although the tunnel section to the north and the Portageville aqueduct usually gets more attention fr om canal buffs, this section, nicknamed, the "Rock Cut" was also a major challenge to the engineers, contractors and workerwho built the canal. The following description of the project from a 1847 New York State Assembly Select Committee Report provides a glimpse of the magnitude of the project: "The line of that section extended from the north end of the aqueduct in Portageville, north to the south end of section 57, known as the 'tunnel section', and was located along near the bank of the river and at a considerable height above the river surface. The mountain near the base of which the line of the canal on most of that section run, rose to a very considerable height and nearly perpendicular and was composed principally of rock - partly solid and partly loose and shelly. This form of the surface of the earth there, made it necessary to cut down the side of the mountain so as to procure a bench or table, on which to construct the prism of the canal &c., and on a slope which would leave the canal reasonably safe from the falling rocks. It will therefore, be seen that the work on that section was immense, and that a majority of it was rock excavation from the mountain side, whence the rocks excavated could be cast directly off into the river channel...."
Section 58's contract was awarded in 1838 to Nicholas Ven Derweken and his brother in law, Robert Powers who quickly began the work with their crew of Irish workers. By the time work on the canal was suspended by the Stop Law of 1842, Van Derweken and Powers had completed the majority of the work - $122,513.04 of what was estimated to be a $135,000 job. (Actually, Van Derweken's bid had only been $90,000, but that is another story that involves accusations of fraud.) The section was finished after work resumed in 1848 and was ready by 1851. The work, visible in part in the photograph, altered the east face of the gorge wall near the Upper Falls. Today the cliff wall that canal workers shaped nearly 180 years ago us undergoing some more change just south of the current bridge as work on a new railroad trestle continues. (Photographs of the current work are often posted on the Letchworth Park Lovers Facebook page.) For more information on the old canal see The Genesee Valley Canal , and Landmarks of the Genesee Valley Canal. You will also find additional photos related to the canal in our Historic Photo Album.